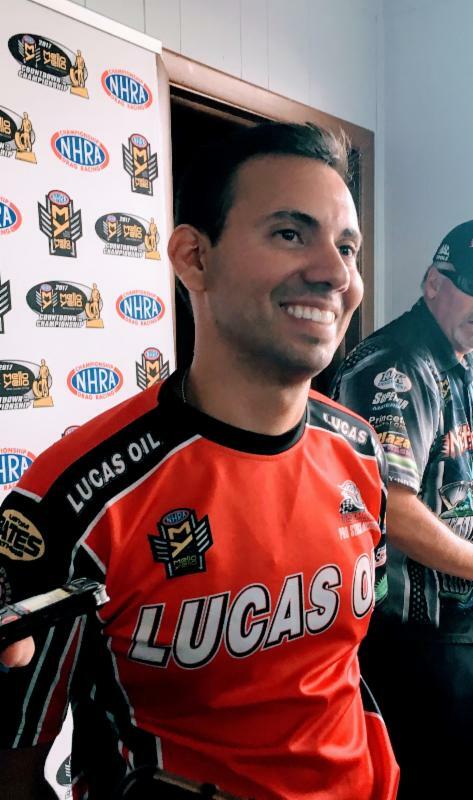 Hector Arana Jr. further solidified his place among the top riders in the Pro Stock Motorcycle class Saturday by locking down the No. 3 position in the elimination field of the 33rd annual Dodge NHRA Nationals. After leading opening day action with a blistering pass of 6.834 at 196.76 mph on his Lucas Oil Racing TV Buell, Arana made runs of 6.868 at 195.79 mph and 6.880 at 194.97 mph during Saturday’s final two time trials. He was bumped down the ladder in the fourth and final session by reigning champ Jerry Savoie and upstart Scotty Pollacheck. “The weather got worse today and most of the other teams seemed to kind of be missing the tune-up a little bit, just like us, so of course our fingers stayed crossed that we would stay No. 1,” Arana said. “But in the back of your mind you know there are a bunch of big hitters out there and more than a few of them can make a big run and knock you out of the top spot. Arana will open race day opposite Charles Sullivan, who qualified 14th with a 7.008 at 189.58 mph. The two riders have not raced one another this year. “We’ve made decent runs in every session so I know we can win races,” Arana said. “We just did a few different things today from Q2 when we ran the .83 so we just have to look at everything and try to figure out the sections of the track where we were fast, find the good things about each run and try to put them all together for one. “Jim (Yates, crew chief) and my dad (teammate Hector Arana Sr.) are really good at coming up with a good plan for race day,” Arana said. “We’ve been running well at just about every race this year and I don’t know why that won’t continue tomorrow. Of course, we won’t look past anybody.